Hear Hobson in the Opera House on the “Great Destroyer.” Jessie Mit and I cannot get seats. Finally go to the “roost”. Fine lecture. “Sandy” gave us an “exam”! Forty-five minutes to give the questions and fifteen to answer them! I answer part of one. Sat. Night. Jessie Mit, Annabel, Addie, and I got to Patterson contest. Helen Lafferty. Prof. Melcher, and Zemmie hold up the honors for the Modern Language. 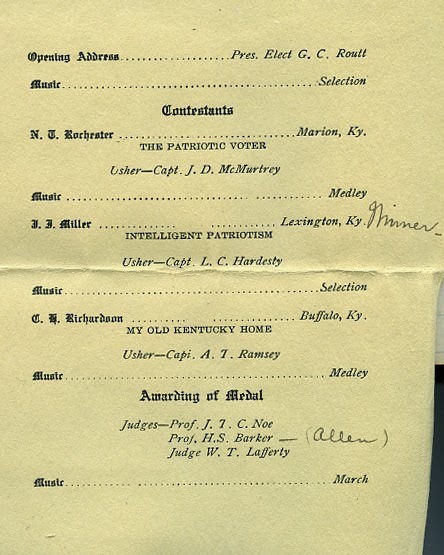 Each fellow had one rate for 1st place. Pres. 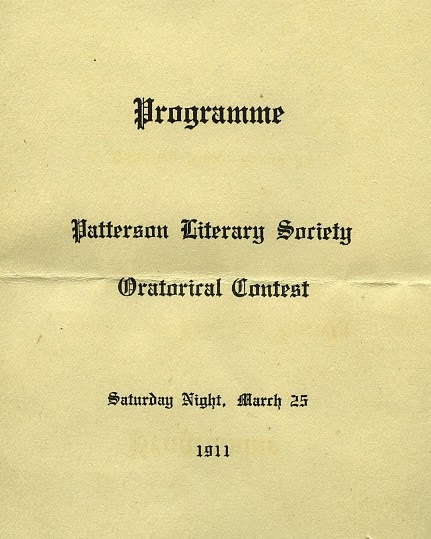 Patterson tells of Patterson Literary Scholarship. *Inserted program for the Oratorical Contest. Miss Cecil arrives with very sore throat and bad cold. Juliette and I borrow lemons, Shiny’s chafing dish, and make her a hot lemonade. By the way, I had forgotten to mention Y.W.C.A. election, when I had the honor to be selected as president. Jessie Mit, Juliette, Edith, Joe, Hattie, Annabel, Alma, and I are the Cabinet. We make many good resolutions. The Good Samaritan Hospital records, 1889-1956 (47M84) have been digitized and are now available via ExploreUK. The records (.5 cubic feet, 1 box, 5 oversize folders; dated 1889-1956) comprise a small group of records and architectural drawings from Good Samaritan Hospital in Lexington, Ky. 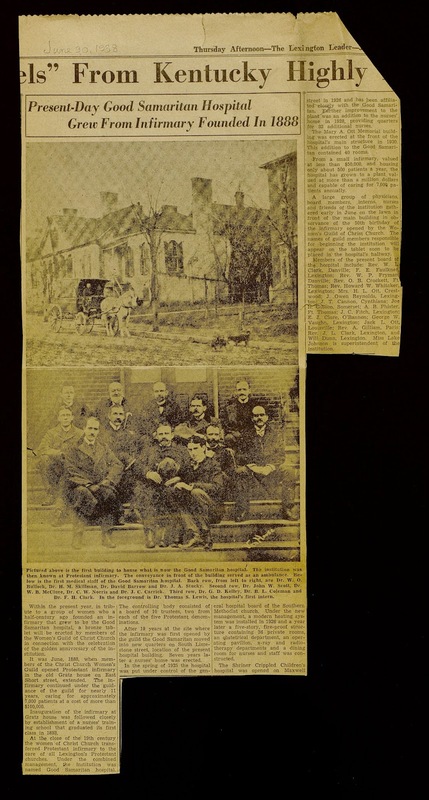 The records include an account book of the Protestant Infirmary (1889-1897); Good Samaritan treasurer’s reports (1908-1911); financial and capital campaign records (1901-1913); newspaper clippings (1929-1953); and records documenting the involvement of George Weeks and Christ Church Cathedral (Lexington, Ky.) in the hospital’s finances (1956). 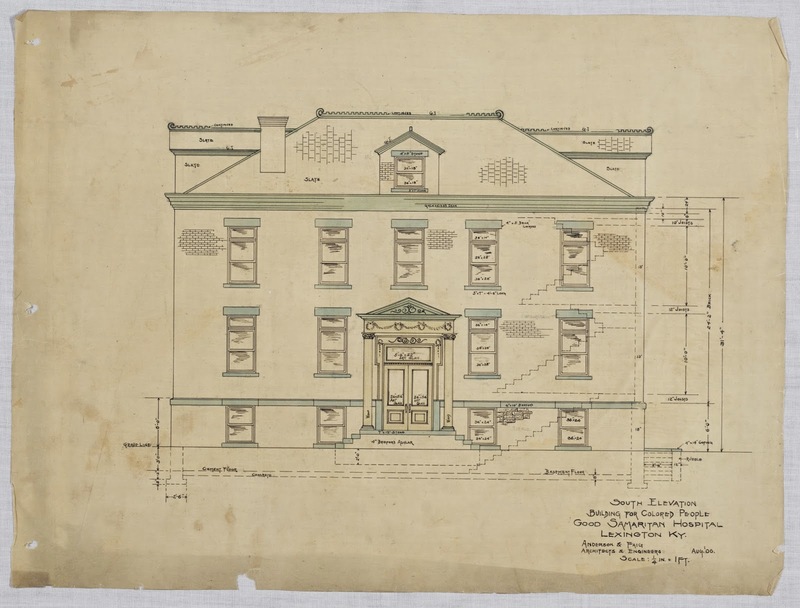 The five sets of architectural drawings on vellum (primarily dated 1905-1906) include complete sets for the Colored Ward, Nurses House, and the Main Building (both drawn by Anderson & Faig). The drawings also include blueprints for alternations and additions to the hospital, dated June 15, 1928, and drawn by Clifford R. Reichert for Starks Building, Louisville, Ky. The complete finding aid can be seen here. 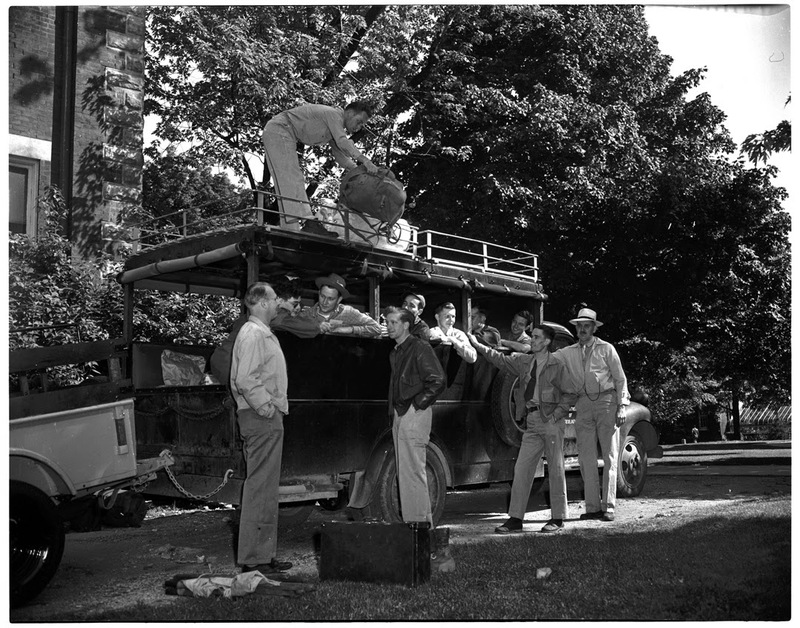 University of Kentucky geologists depart for Black Hills of South Dakota. 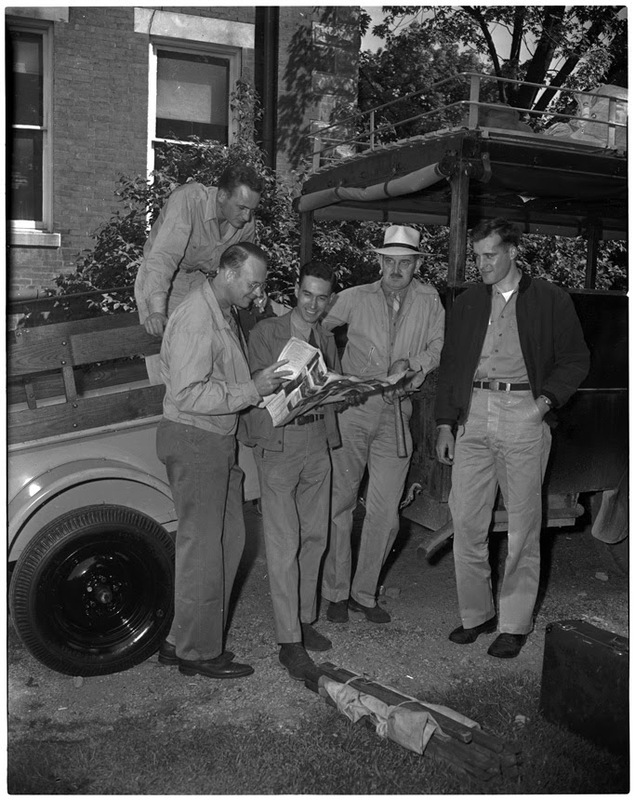 Pictured are Dr. A. C. McFarlan, head of University of Kentucky geology department, and his son, A. C. McFarlan, Jr., along with Richard Naylor, Vincent E. Nelson, and W. R. Brown. I take German in morning class, Zemmie, dear soul, excuses me early from French, I make a desperate run for the train and have to wait 25 minutes for it. Read “Idea” Mr. Kohn had given me, on the train. Bernice and John meet me and I go up to school to the Sterling. “Shall Mt. St. have brick streets?” Weighty question-continued. Charley Rainey coming to State next year. Go to dressmakers and then home. Stay home Saturday. Make some candy. Go to Grandma’s Sunday morning, to Aunt Georgie’s in the afternoon. Uncle Frank gave me some money. Fried chicken for breakfast and Grandpa helps me to the train Monday morning.